I started the year with another ambitious goal of 100 books (using the Goodreads site to log and track), as last year I read 119. Through June, I’ve managed 58. I’m grouping the books as I did in last year’s recap by the month in which I finished them (and fiction/nonfiction subgroups.) As the list is already quite long, and I’ve decided to tag all of the authors and titles, I’m publishing the first half of the year as a standalone. 9 of the fiction were Arthur C. Clarke novels. The last of the Big Three (Asimov and Heinlein being the other two, though Heinlein doesn’t warrant the distinction…IMO), I think he did well with science fiction and not so well with things that involve people. I’ve linked all of my Goodreads reviews (even if only one line) to each title, in case anyone is interested in what I thought. Saturday was a beautiful day and we needed to focus on the outside chores…trimming back all of the bushes, some of the trees, beginning the task of getting the pool ready for swimming, etc. I worked on the pool for about an hour before rousting the troops to get on the greenery. After six years living here, I still can’t figure out who plants a sweet gum tree right next to a pool, nor can I understand planting that pernicious weed honeysuckle. Another year for me to dislike it and it hasn’t even starting reeking yet (That’s just me…Andrea likes it). While pulling out some of the long runners from behind a less aggressive bush, I discovered a small moving mass of dark fur. I t turned out to be FOUR small masses of fur…kittens. Tiny kittens. Probably less than three weeks old. I let them be while we moved on to another part of the back yard, for the mother would show up now and then atop our ten foot wooden fence and look down on her charges. After we worked our way to the front yard, Drew and Dylan saw the momma racing on the other side of the house, across the street, with one of the kittens in her mouth. Over the next hour or so, she moved two more, but the last one was alone for quite a while. I read somewhere ages ago that dogs and cats don’t have a concept of four or more – one, two, three…many. The species will propagate fine with those three. Whether or not the counting anecdote is true, this particular mother stopped one short of “many”. When it became apparent that the mother wasn’t coming back, Andrea rescued the six inch long mewler and set about trying to figure out how to care for it and find someone else who could take over the care. 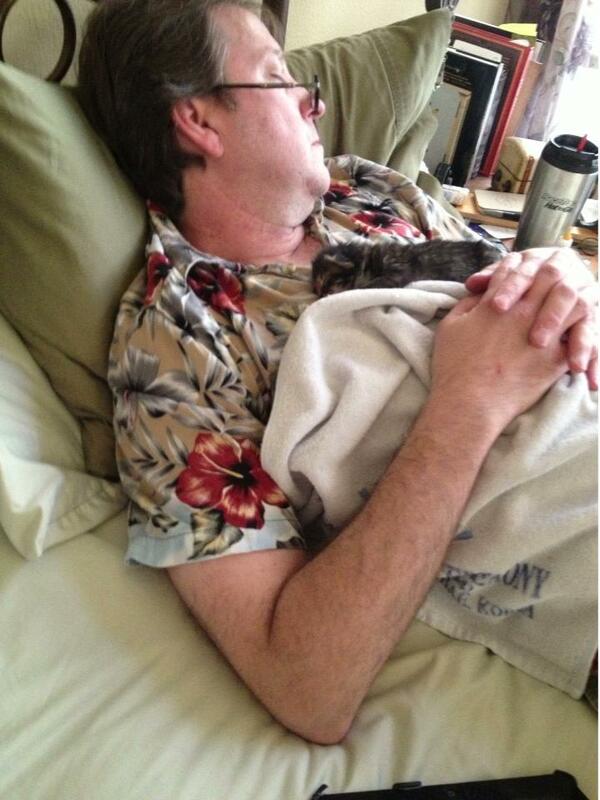 This shot is me, exhausted after all the yard work (unfinished, unfortunately, as we ran out of battery charges for the hedge trimmer), holding the tiny critter as I was “reading” a book on my iPad – note the reading glasses. Meanwhile, Andrea contacted someone who fosters cats/kittens and learned that the kitten might not last the night as it refused the fake milk Andrea got at the pet store. Persistence paid off, though, and Andrea did get the little one to drink some. I didn’t wake nearly as much as Andrea (exhausted, remember? that’s my story), but that tiny critter did survive. And the fostering contact found a host who had a nursing mother cat, so Andrea’s taking the kitten now to meet up and hand off, hopefully to a better life.